Well, it seems I'm finally going to get my wish on Black Friday. According to the following Sears flyer (leaked by the folks at multiplayerblog.mtv. 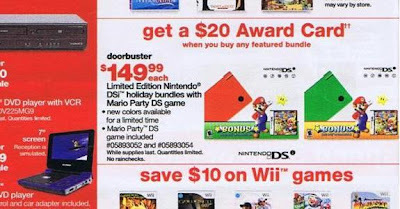 com), Nintendo is prepping a pair of $149.99 "holiday bundles" that will include either a red or green DSi system and a copy of Mario Party DS. Will this negatively impact my plans to buy a Twin Famicom or a PS3--or, who knows, an Xbox 360--after the holidays? Honestly, I have no idea. I still really want a DSi...but I think I'm going to hold out until my birthday in April for a 3DS. Yeah, I completely understand that. I really can't see myself buying one either, despite the fact that I really want one (esp. a red one!). I think if you haven't bought one yet and you're at all interested in a 3DS, you might as well wait for the 3DS, as it will do everything the DSi does and more. But that's just my opinion! hehe, DS is only excuse for not buying Twin Famicom, approved. I'm also wont buy 3DS, eheh, until it gets to europe, and get cracked. i looove my ds, hope you'll love urs to. Sorz for mistakes its morning here in Ukraine :3. Hey there Nuts! Actually, I have a DSlite at the moment, and I enjoy it very much :) Just haven't bought a DSi yet. Despite what I said in this post, I'll probably pass on the DSi and wait until the 3DS, like Justin. I may wait until the equivalent of the 3DSlite, though -- kind of like how I didn't buy the original DS but waited for the DSlite. As for Black Friday -- don't worry, it isn't racist. I'm not sure why it's called Black Friday, to tell you the truth, but regardless it's the term that's used for the Friday that follows our Thanksgiving (which is always the fourth Thursday in November). This Friday is considered the biggest shopping day of the year in the US, which is why Nintendo and other game companies put out special deals and bundles that day.